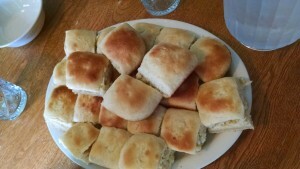 If I can make perfect rolls, you can too! I do not like making bread, especially yeast bread. Normally, the dough doesn’t rise for me, or I make such a big mess with flour, I just regret it. Well, a couple weeks ago, I decided to give it a shot. We were having the sister missionaries over, and we had no bread to serve. What caught my eye was that there were minimal ingredients, all of which I had. I decided to try the recipe out. I used my mixer and dough hook for the first time. All went well up until the point I had to knead the dough for a minute or two. Well, I found a flaw in the recipe. The dough was extremely sticky, and impossible to knead, even with a lightly floured surface. I had to add probably two cups of flour while I was kneading, to get the dough to a workable consistency. So, I let the dough sit, covered. It is also good to spray the bottom of the saran wrap, so the dough doesn’t stick to it as it rises. The dough actually rose! I was so thrilled. I didn’t bake the rolls right away, but put them in the refrigerator until I was ready to bake them. That did not cause any problems at all. The recipe says to bake the rolls for 15-18 minutes. I believe mine were done sooner than that, so just keep an eye out. They smelled and looked amazing. They also came out of the pan easily after I cut them. So, how did they taste? Well, I am thrilled to tell you that they were so amazing, I kept wanting more. 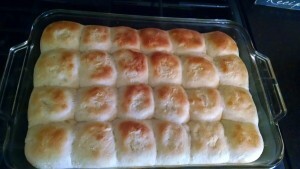 In fact, they tasted almost exactly like my favorite frozen rolls: Mrs. Schubert’s. You don’t need to put butter on these if you don’t want to. They taste wonderful without it. I definitely recommend these soft, buttery rolls. In a large bowl combine warm water with yeast and 1 teaspoon sugar. Set aside for 5-10 minutes. Using your mixer with the dough hook attached, combine butter, sugar, eggs and salt. Add in the yeast mixture and mix to combine. Add flour, 1 cup at a time, mixing between each cup. When the dough starts to pull away from the sides of the bowl, you’ve added enough flour. You should need about 4 cups total, give or take a little. Place the dough on a lightly floured clean working surface and knead for a minute or two. Divide the dough into 24 each pieces, then roll each piece into a smooth round ball. Prepare a 13 x 9 inch baking dish by lightly greasing it. Place the dough balls into the pan, leaving equal space between each round ball. Cover the rolls and let them rise for about 60-90 minutes, or until doubled. Preheat your oven to 375F. Bake for 15-18 minutes, or until the rolls are golden brown.